Testing home air quality is crucial because many threats are undetectable to the human senses. Common household pollutants include carbon monoxide, mold, radon and volatile organic compounds, or VOCs. A range of health problems can occur if your home's air quality is poor, including headaches, nausea, damage to the central nervous system, and even cancer and death. Invest in the right testing equipment so you and your family can breathe easy in your home. Someone is touching an at home air quality detector. In the home, any fuel-burning appliances, including fireplaces, gas stoves and barbecues, can emit carbon monoxide, an odorless, colorless and deadly gas. It is impossible to detect dangerous levels of carbon monoxide without an approved testing kit. Simple kits are available for less than $10. Test in kitchens, around wood stoves and fireplaces, and in garages. 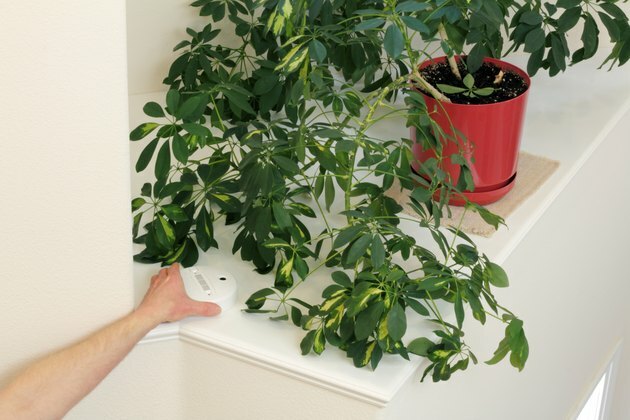 Look for a kit that adheres to your wall or door. Check it regularly. On most kits, a spot will turn dark when carbon monoxide is present and return to its original color when the air is clean. Follow manufacturer directions, paying close attention to life span. Most kits last for at least three months after they're opened. Carbon monoxide alarms, meanwhile, sound an alert if the gas reaches a harmful level. For complete coverage, place one of these on every level of the home and one in each sleeping area. A mold testing kit identifies toxic mold in the home. Typically, a kit comes with test strips, samples bags and detailed instructions. Read the instructions carefully. All-in-one self testing kits are available, but the EPA strongly advises sending samples to a professional mold-testing company. Some home kits allow you to collect samples from different areas of your home and include posting materials so you can send them to an independent lab for analysis. A more expensive option is to have tests carried out by a mold remediation company. Like carbon monoxide, radon is impossible to detect without an accurate testing kit. If you want to hire a qualified radon tester to do the testing for you, contact your state radon office to get a list of qualified professionals. You can do the test yourself, which involves placing a short-term test in your home for between two and 90 days, depending on the device. Always follow the manufacturer's directions for use. Bear in mind that, as radon levels can vary daily and seasonally, short-term home testing kits are less likely to reveal your home's year-round average radon level than long-term testing carried out by qualified professionals. Low-cost USB sensors plug into your computer and detect and monitor levels of VOCs in the area. When you plug the USB sensor into your computer, a graph will appear on your screen. Most USB sensors use a light indicator system: The LED light on the monitor will glow green if air quality is good, yellow if air quality is fair and red if air quality is poor. How Do Radon Test Kits Work?